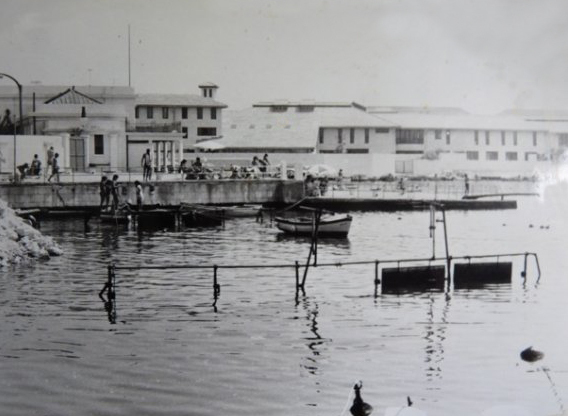 1952 During the summer term of that year, the local schools often took their pupils to the Montague Bathing Pavilion whenever the weather became too hot for other pursuits. It was the closest thing to a swimming pool available at the time. In its hey-day the pavilion had been considered quite an elegant place to go to. After the war, however, it had been allowed to run to seed to such an extent that it had become one of the most dangerous places imaginable to swim in. The slipways were covered in algae and were as slippery as an ice rink. 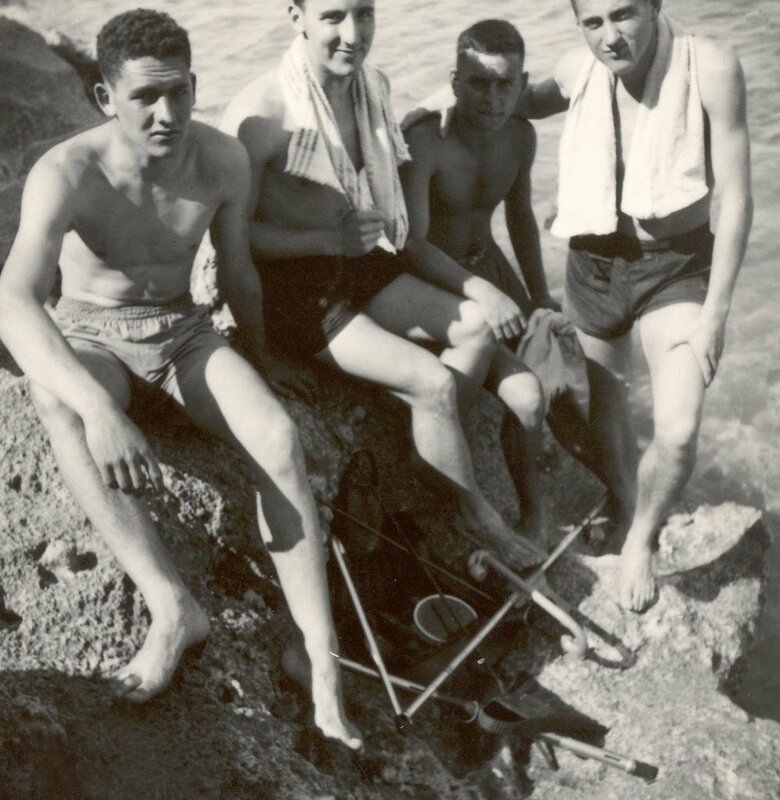 The seabed was strewn with jagged pieces of metal of unknown origin and many Gibraltarians still bear scars on their bodies as testament to their diving prowess at the pavilion. There was tar all over the place and the children loved it. The view from the Calpe Rowing Club towards the Montague. Unbelievably we used to play waterpolo on this small untidy stretch of water. There were also other interests that summer. A small group of my friends had taken up underwater fishing with a vengeance. The original partnership consisted of several of my school contemporaries. Among the leading lights were Henry Latin and a cousin of his who was also confusingly called Henry Latin. 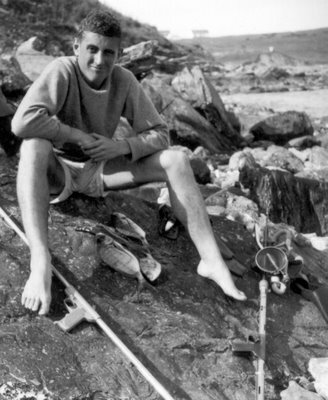 We had all recently come across books on the subject by Hans Hass and we now spent most of our free time dreaming of the possibility of leaving the Rock, and living off whatever we could fish for the rest of our lives. 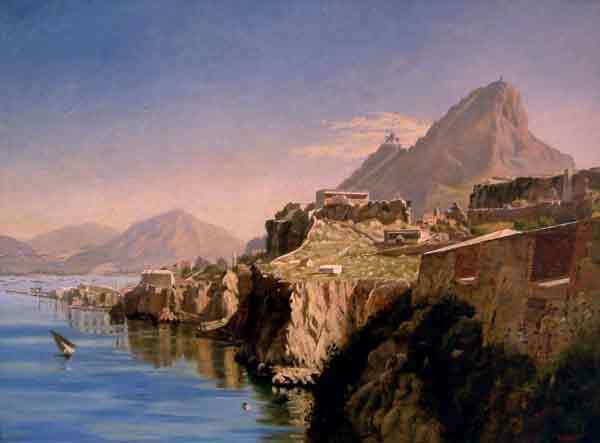 Places such as Brazil and the Caribbean featured prominently in our plans. Eager Winter fishermen at Getares beach. I can’t place the two in the middle but that’s me on the right and Henry Latin on the left. To be fair, at that time underwater fishing was by no means as popular as it would become one day. In fact we were probably the first people ever to have practiced the sport locally. Equipment was hard to find and much of it was either homemade or navy surplus. There were eternal arguments as to the relative merits of the various types of guns which were then available. Some people swore that there was nothing quite like rubber, others would have staked their lives on steel springs. By common consent, guns using compressed air were the most desirable. Unfortunately they were not on sale locally and in any case would have been far too expensive for any of us to afford. The most powerful gun available was a spring loaded affair called the Nimrod. It was a formidable weapon made of polished metal and stood over seven foot in length when loaded. The spear itself gave the impression that it had been designed to penetrate steel plate. It was an absurd choice for anybody fishing the shallower waters of Mediterranean where the average size of the fish was never likely to be more than a couple of pounds. After months of pleading, saving, scrounging and stealing, I went out and bought myself one. More Winter fishing at Getares Beach. The famous Nimrod lies on the left. Look at the size of those fish! Although memories grow fainter with time, it is probably true to say that neither I nor anybody else ever caught anything with that gun. The trouble was that most of the best fishing entailed swimming out to wrecks that were usually found quite a distance from the shore. And the trouble with the gun was that once fired, it was almost impossible to reload it unless one was back on dry land. The net result was that whoever wielded the gun - and I was always more than willing to swop with friends - was always loathe to aim it at anything smaller than a medium sized whale. The result was that the thing was hardly ever fired in anger. We were, however, undeterred. Not even the arrival of freezing weather was capable of stopping us. When autumn arrived we simply dived in with all our clothes on. Such niceties as wet suits were unheard of in those days. The design and manufacture of an underwater camera took the entire summer holidays to develop. The resulting enormously clumsy-looking, semi-waterproof wooden box with a cheap Kodak Brownie box-camera inside was tested and retested and always found wanting. It was almost impossible to submerge. But it did take at least one underwater photograph. Somewhere in Gibraltar, in someone's photo-album, there is a very murky photograph of the bottom half of an individual standing waist-high in the water. Only the legs are visible. They are my legs. A romantic view of Rosia Bay from an old painting. We did a lot of our underwater fishing here and in nearby Camp Bay when we started off. Unfortunately the place looks completely different in my days and even more different today. Unimpressed by all this, the Spanish Government decided it was time to sponsor the Sindicato de Trabajadores en Gibraltar. Headquarters were opened in La Linea and membership was a prerequisite for anyone who wanted a permit to exit or enter La Linea. Despite official heavy-handedness, the Union proved a success and eventually as a result of strikes, threats of strikes and other similar forms of persuasion, the Sindicato forced a few notoriously bad private employers into labour contracts. At that time there were three Gibraltarian unions recognised by the British authorities. But their aim was the protection of Gibraltarian employees rather than employees in Gibraltar. They consequently failed to attract Spanish workers who were in any case prohibited by the Spanish Government from becoming members of a Gibraltarian Union. 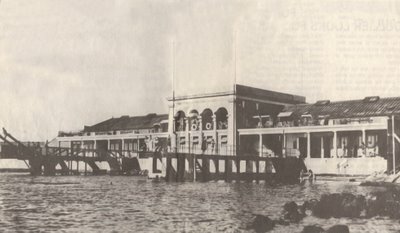 The three Gibraltar unions later amalgamated with the Transport and General Workers' Union. A few members of the family continued with local religious traditions albeit with increasing reluctance. On the whole it could honestly be said that none of them had ever been particularly willing observers. Sunday Mass tended to be postponed to the very last session possible, and attendance, by the younger members and their friends at any rate, consisted of hanging about as close to the door of the church as was possible without actually being outside. 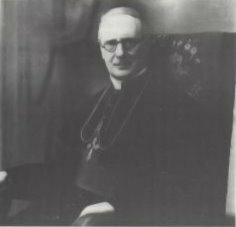 The Catholic prelate at the time was a Bishop Fitzgerald. 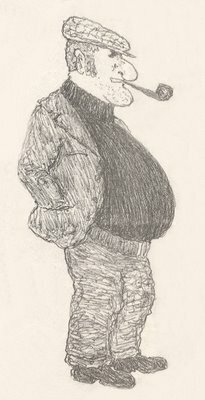 He was a big, full-blooded individual with a strong character and was reputed to have once struck a drunken sailor with a silver topped walking stick which he always carried with him. He was, of course, an Irishman. Unfortunately he also always insisted on giving his interminable sermons in Spanish. These he would deliver in an indistinct monotone and were almost universally taken by church goers as a signal to start daydreaming. Some of the more reprehensible members of the congregation often wandered off for a quick fag at this point. In fact, the exact point at which it was permissible to leave the church for good without actually committing a mortal sin was often the subject of much heated debate. The first signs of Benediction at the end of the service invariably caused a mini-exodus, as on this point at least it was known on good authority that attendance was not compulsory. The committing of mortal sins, incidentally, was always something that lay heavily on the conscience of most children of my age. This despite the fact that all you had to do to get rid of the burden was to go and confess your sins to a priest. The main problem was the wait between the commission and the forgiveness. A Gibraltarian schoolboys' interpretation of the teachings of the Church was that if you died with a mortal sin on your soul you were automatically condemned to eternal damnation. This meant that if you were hit by the proverbial bus while you were on your way to the confessional you went straight to hell. However, if you were struck by lightning just as you left the church heaven awaited you with open arms. In fact if the bolt struck you immediately after you had been forgiven you even managed to bypass purgatory. Even when I was just into my teens I remember feeling rather uneasy about the whole thing. It seemed to me that whether you ended up in heaven or hell was very much a matter of chance. In fact it was a pure lottery. And to make matters worse, the punishment seemed out of all proportion to the crime. The type of mortal sins committed by people like myself hardly warranted such a savage response from the Almighty. 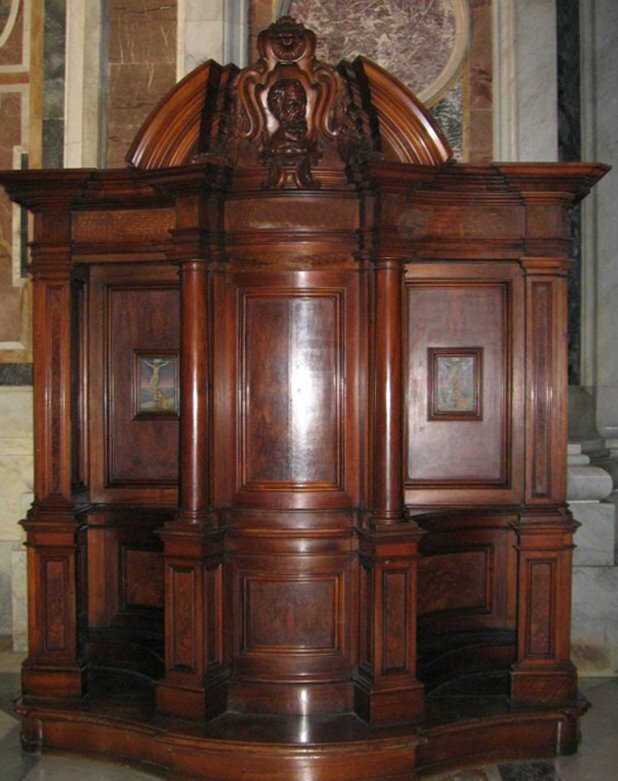 The confessional. Ours were not quite as imposing but you can get the idea. Confession itself was another farce. Our teachers encouraged us to go to confession at least once every month. This meant that the proceedings eventually became ritualised through constant repetition. The dialogue usually went something like this. Penitent: Forgive me father for I have sinned. It is three weeks since my last confession. Priest: Yes, my child. Have you any sins to confess? Penitent: Yes father. I have lied, and I have said bad words. Priest: (Yawn). Yes my child anything else? Penitent: I have disobeyed my mother. I have also thought bad thoughts and have done bad actions. Priest: How many times my child? (The truth was it didn't matter a damn. Once or a hundred times you still ended up in hell - for ever. Not even God can make eternity last any longer. Nevertheless, there was always a slight pause before answering as the penitent carefully recalled his exploits of the previous three weeks to make sure he gave the right answer. Lying to a priest during confession was a sin worse than being responsible for the holocaust. Penitent: (Embarrassed) Eight times, father. And so it went on until finally the penitent was issued with a penance which always involved reciting multiples of three 'Hail Marys' and one 'Our Father', the number entirely dependent on his answer to 'how many times'. When the penitent finally left the church it was always with a sprightly step and a smile on his face. You could almost see him daring that bolt of lightning to strike him down. My grandmother Maria Luisa, true to form, was always pestering people to go to Mass. If she ever went herself, however, she must have done so in secret as nobody ever saw her go. My mother was definitely a church-goer but was rather surprisingly very anti-clerical. 'You must have had a bad experience'. Her children never asked her why she disliked the clergy in principle, but the one who came visiting may have hit the nail in the head. It was personal rather than political. 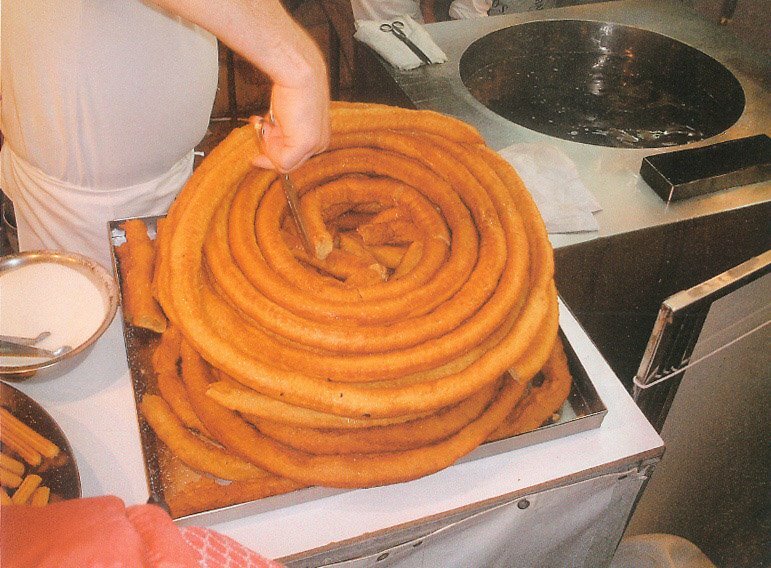 Sometimes, when for one reason or another I was obliged to go to an earlier mass than usual, I was often assigned the task of buying 'churros' for Sunday breakfast. In those days the stuff was purchased from a grubby little shop in a basement where it was made to order. Enormous quantities of the dough were usually kept in a bath. A known amount was then stuffed into a special wooden container which was then waved expertly over a huge cauldron of boiling oil. Health and safety and fire regulations were still very much a thing of the future. The first blob to touch the oil was followed quickly by an ever widening wheel made up of a continuous spiral of dough. Once it was fried to perfection, the wheel was placed on a newspaper, hit across its diameter with a karate chop and bent over to form a semi-circle. The stuff was delicious, especially the blob in the middle which was usually the cause of some good natured bickering as there was only enough for one. Pepe Bicha and Caradura were two well known street characters of the era. Pepe La Bicha was a layabout whose build made him instantly recognisable. Although nobody recalls ever having seen him drunk he did seem to spend most of his time in his favourite pub, silently drinking beer and smoking a pipe that was never far from his mouth. The nickname was said to derive from the fact that he had a snake tattooed on one arm. 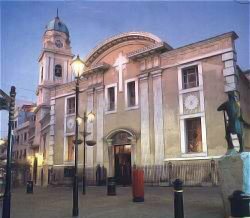 Caradura was a fellow employed by two local cinemas called the Theatre Royal and the Rialto. One of his jobs was to advertise films which he did with the aid of sandwich boards and a megaphone. He must have been something of a frustrated actor as he took great pains in dressing up in keeping with the theme of the film. He often also daubed so much make-up on his face, which was naturally expressionless, that it looked like a mask. He would stroll up and down Main Street completely impervious to the occasional jeer from passers-by of ‘Caradura majaron!’ The caricatures were two of a series drawn by Eric Chipulina for an article on street characters of long ago published in the Gibraltar Chronicle. I spent a lot of my time during Sunday mass loitering near that doorway. 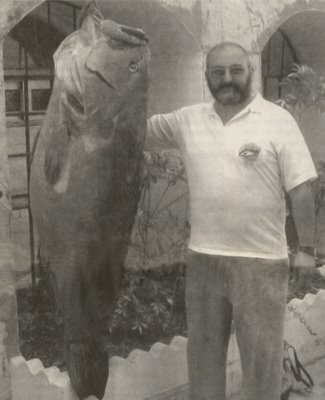 Jesus Balban with a 50 Kg Cherna. Jesus caught this little fellow in 2004. It was just one of many that he, his wife and his family have caught over the years. I thought I would include this photo just in case anybody might have had any doubts about the size of fish that one can catch off the shores of Gibraltar. Pity I never managed to catch one myself! Jesus is Valerie’s husband, and Valerie is my brother’s eldest daughter.